05/06/2011 - Raffaele Marciello (BVM-Target) took the victory of race 2 in Misano's second round of the Italian Formula 3 Championship after strenuously defending the lead obtained at turn one. The Swiss driver thanks to his 16 years of age, is in the history of Italian motor-racing as the youngest driver winning a race in the prestigious tricolored series that this year celebrates its 46th edition. The pupil of the Ferrari Driver Academy was kept under pressure for the whole 19 laps by Eddie Cheever, started from the pole according to the top eight grid inversion of qualifying. The driver of Lucidi Motors had to give away his position at turn one but kept the slipstream of the frontrunner attacking in several occasions but without success. The third place of the podium was obtained at the very last lap by Sergio Campana (BVM-Target) who after overtaking his French team mate, Maxime Jousse, also overtook the Argentine Facu Regalia (Team Ghinzani) in the last turns of the race. Behind the Californian Michael Lewis (Prema Powerteam), Edoardo Liberati (Team Ghinzani) ended seventh harvesting important points for the classification that he leads ahead of Marciello standing 6 points from the top and Lewis at -7. The French driver Brandon Maisano (BVM-Target) followed by the Italians Daniel Mancinelli (RP Motorsport) and Federico Vecchi (LineRace-Co2Motorsport) ended the top ten of a thrilling race. The next round of the championship is scheduled for 17 July in Imola. Marciello had the best start of race two and managed to overtake Cheever who despite being started from the best spot of the grid was relegated to the second position, followed by Regalia, Jousse, Lewis and Liberati. Team Ghinzani's driver tried to attack the Californian that managed to defend himself. Giovesi and Krohn had to come into the pits after the heat of the first metres, while Campana, Maisano, Guerin and Iaquinta completed the top ten. Meanwhile, the top four drivers put up a good show with Maisano, Cheever, Regalia and Jousse battling ahead of Lewis that at lap three had a good margin on Liberati and set the fastest lap of the race. Lap five witnessed the contact between Guerin and Mancinelli when the two were fighting for the tenth place, Vecchi got advantage of this. During the same lap Marciello and Cheever pulled away while behind them Lewis, Liberati and Campana went great guns. The Italian came abreast of the Californian but cannot succeed in the attack exposing himself to Campana that gained therefore the sixth position despite risking to jump on Lewis' car. The duel for the first position got into its heart at lap eight with Cheever moving a spectacular attack on the outside while in the following lap Campana managed to overtake Lewis who had to defend the sixth place from Liberati and Maisano, ahead of Iaquinta, Mancinelli and Vecchi fighting for the ninth place. Campana meanwhile put the hammer down and scored several fastest laps getting Jousse's slipstream with the latter forced to give his position away during lap 15 when the Italian had to go a bit wide on a kerb.The French tried to counter but the driver from Modena thanks to clean track in front of him pushed hard and accumulated some gap. The fight for ninth ended in favour of Mancinelli as Iaquinta slowed down and also gave his position to Vecchi. The last laps are breathtaking with an unleashed Campana forcing Regalia to the error and gaining the third place of the podium. 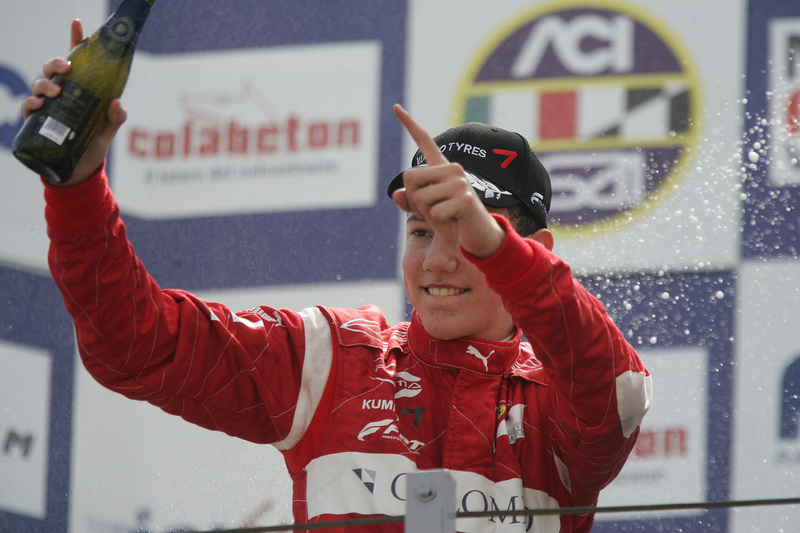 At the finish line, Marciello won ahead of Cheever, Campana, Regalia, Jousse, Lewis, Liberati, Maisano, Mancinelli and Vecchi.